It really isn't fair that such weighty compositions as the four pieces contained in Franz Schubert's Op. 90 (D. 899) were given the rather inappropriate title "Impromptus" by their publisher when the first two went to press in late 1827; it wasn't until 1857 that Op. 90, Nos. 3 and 4 appeared in print. These are not just pieces of higher-grade musical meat than the average short piano piece of the 1820s. These are pieces of considerable length, three of them even spanning more than 200 bars, each a well thought-out expression of pianism that creates no sense of improvisation. The four Impromptus, D. 899 were probably composed at least in part during the composer's stay in Dornbach in the summer of 1827; they seem all to have been put to paper by the time Schubert arrived in Graz in September. The first piece, in C minor, is marked Allegro molto moderato and starts off with a firm double-octave utterance, the likes of which would pop up again some five decades later at the start of Johannes Brahms' C minor Piano Quartet. Instantly, however, Schubert pulls this solid rug out from under our feet and proffers a limber, pianissimo melody -- initially unaccompanied, but soon harmonized in march-like fashion -- that, in one form or another, will saturate the entire piece, most notably in the shape of a warm A flat major melody that rides on top of triplet arpeggios in first the left and then the right hand. The piece falls into two loose halves, the second of which starts off with a reworking of the opening measures of the first -- the continuous triplets now propel the music forward in dramatic fashion -- and then recasts the A flat major melody in G major. There is something etude-like about the far-flung, continuous eighth notes in Op. 90, No. 2 in E flat major/minor. During the middle section of this "da capo" piece these eighth Schubert breaks the eighth notes up a bit to set up some powerful sforzandos. Somewhat surprisingly, the piece veers into the minor mode during its ever-faster coda and never escapes back into the major mode. If you took the Adagio cantabile of Beethoven's Pathétique Piano Sonata and mated it with any of a dozen Chopin Nocturnes you'd probably come up with something very like the Andante in G flat major, Op. 90, No. 3. In fact, Schubert lifted the cadential gesture of this lovely melody straight from that heavenly Beethoven movement. The last impromptu of D. 899 is an Allegretto in A flat minor/major that more or less assumes the form of a scherzo and trio (Schubert even goes so far as to call the less-frantic middle section a "trio"). 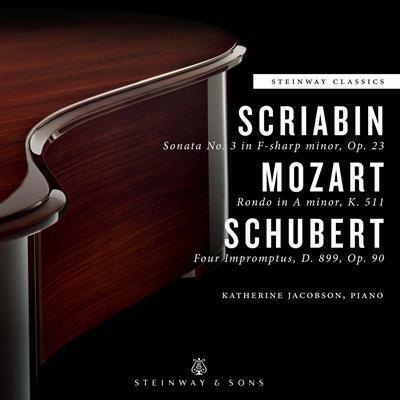 At the start of the piece, all attention is fixed on the cascading sixteenth note arpeggios, but midway through the "scherzo" portion -- which is of course reprised "da capo" after the trio -- Schubert inserts a delightfully swinging melody into the upper voice of the left hand.